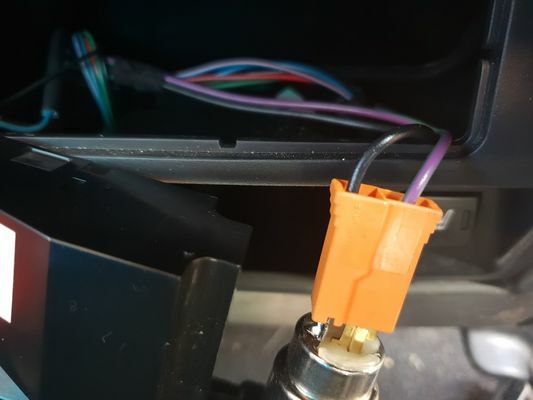 I have tried to search the forum the answer but the topics all seem to point to better connection ideas rather than which wire was which; all I'm after is the correct ignition live colour in order to use a Scotch connector to wire a Parrot into. Any help appreciated! It should be the purple/blue trace, but you ALWAYS check when it comes to wiring, so use a test lead or multimeter to confirm. Better to be looking at it, than looking for it! The +ve is the centre pin disconnect the plug and use a meter to continuity check it, or test for a +ve at the plug to make sure....how did you get the panel out I've just ordered a small volt meter to replace the socket on one side and a usb charger for the other? Difficult to explain really but I just pushed the tips of my fingers into the sides of the flapped panel and gently but firmly pulled it towards me... it felt a little dodgy at first as I thought it would break but apparently not.